Walls Farm is located close to the village of Wedmore. It sits just a few miles south of the Mendip Hills, north of the Somerset Levels, east of the Bristol Channel and west of the historic city of Wells. Walls Farm is surrounded by its own grounds of approximately six acres. Formal flower gardens, a productive vegetable garden, orchards and a large pond all attract a wide range of wildlife. Swallows nest in the garage, Green Woodpeckers are often on the lawn, we have our own colony of Goldcrests in the pines – and often a rather bold Little Owl sits and hoots on the garden pergola. The 'Duck House' is our stunning larger barn conversion, stylishly furnished throughout - it is amazing to think that we used to keep ducks in here! Completed in April 2018 it offers 2 bedrooms and 2 bathrooms equipped with large power-showers. The real 'wow-factor' of the cottage is the large open plan Kitchen/diner/lounge with huge glass sliding doors that overlook the garden. Underfloor heating throughout the ground floor and a fabulous log burner will make for cosy evenings in the colder months. Set in the grounds of our Grade 2 Listed farmhouse the barn offers every comfort, including wi-fi, t.v. and a well stocked and interesting bookshelf. Our heated indoor pool is available with prior arrangement (just to fit in with owners use) the pool is adjacent to the owners house. My husband and I live at Walls Farm with our three children two dogs and a handful of hens. We run a small birdwatching company enjoy working on our garden and staying at An Gearasdan our house in the Highlands. We have an indoor heated pool which is adjacent to our house - the pool can be used by arrangement. Extremely well designed and equipped, warm and cosy but stylish at the same time! Wonderful hosts and the treat of a pool a real bonus. Wish we could have stayed longer and would highly recommend. Thank you Kay for hosting us! Thank you so much for your review and so glad you enjoyed your short stay - would love you to come back for longer! The cottage was left spotlessly clean - thank you. The house was well designed and comfortable. Kay welcomed us warmly on our arrival. We enjoyed our short break and found the Duck House well-appointed and tranquil. We were grateful for the tea, coffee and fresh eggs. The swimming pool was a lovely bonus! We stayed here on a business trip and was like home from home. The barn is beautiful and furnished to a high standard with great attention to detail, sparkling clean and extremely comfortable. I would highly recommend staying here! Thanks to Kay for looking after us. Thank you so much for lovely review and being such fabulous guests. Modern, stylish accommodation & very friendly owners! We stayed here in October 2018. 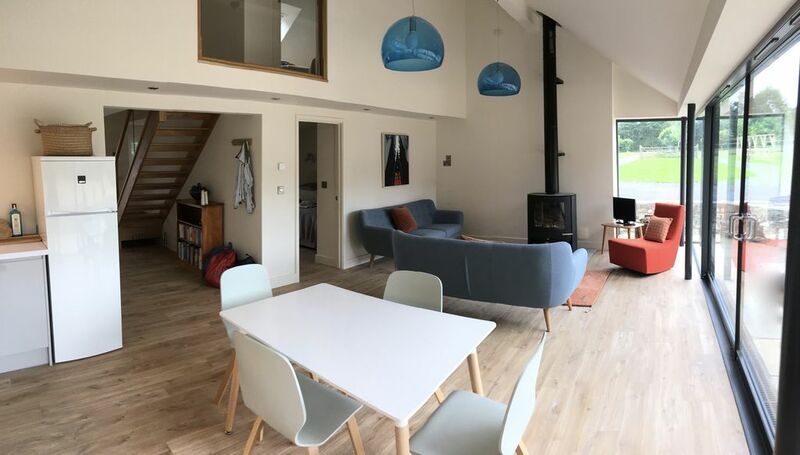 This is a very modern, clean and stylish farm building conversion in a very quiet, private setting. The owners, Kay and Graeme are the perfect hosts - very friendly and welcoming. The highlight is the large indoor swimming pool which we were able to use every day. It was heated, nice and warm and our children loved it. I wouldn't hesitate in recommending this property to anyone visiting Somerset. Hopefully we'll return one day! Thank you so much for your lovely comments - do hope you had a good journey home, and thank you for leaving the cottage so tidy! We would love to welcome you back some time soon. This cottage is stunning indeed! Superbly equipped, and set in the most serene and pleasant location. This is a real gem. The cottage is very luxurious, and the hosts exceptionally helpful and friendly. We had such a great stay here. Thoroughly recommended. Thanks for everything. Thank you so much for your fabulous review and thank you for being such lovely guests - please come back and visit us again..